Employees tell us they'd wish their boss or corporation would advertise with Helicopter Links. Just a little background first, if you don't mind. (If you already know what Helicopter Links is and know about our free listing offers, please skip down to the 3rd paragraph.) Helicopter Links is an online international directory of helicopter companies, suppliers, services, manufacturers, magazines, trades shows, organizations and museums. Since buyers use directories when they are in the buying process, we offer sellers the opportunity to advertise directly to buyers on our website. 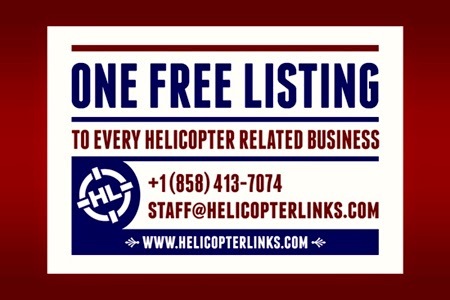 However, what some of you may not know is that Helicopter Links also offers one free listing to any helicopter related company, supplier or service—worldwide and has other free listing offers. Third (3rd) Paragraph: With all that said, there is something that many business owners and corporations do not know. Many sales people contact Helicopter Links each year asking for a free listing since their company does not advertise. The owners or heads of marketing departments don't even know their sales people are going above and beyond to help increase the sales for the companies they work for. The salesperson will tell me, over the phone, that the business owner or corporation simply does not advertise even though the salesperson knows that advertising is important for most businesses. They are very concerned about their company's lack of proactive marketing and they tell me this inaction is hurting their sales numbers. "We really would like some help to make our jobs easier and for our employers to at least give us a fighting chance!" they tell me. And I obviously agree and sympathize with these sales people. I usually tell them my advertising horror story which took place about 16 years ago when I was a salesperson. Before I worked for the yellow pages, I worked selling industrial equipment in a small branch office in San Diego (three people on staff including the boss) which was part of a large manufacturing company based in Los Angeles. One day I asked my boss why we were not advertising in the trade magazines? 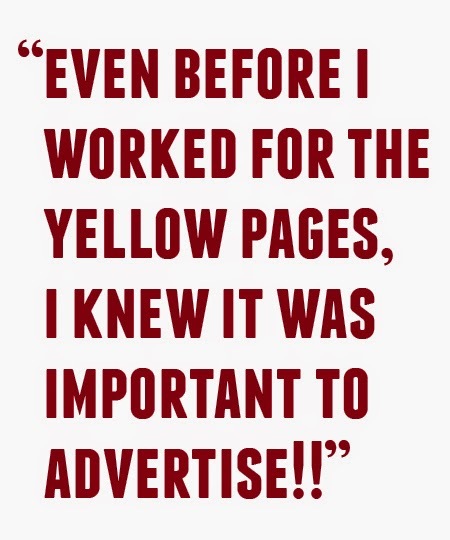 Even before I worked for the yellow pages, I knew it was important to advertise!! He responded to me, "Well we could, we have $8,000.00 allocated each year for advertising but I never do it. I just add that money back into the sales figures and it makes our sales numbers look higher at the end of the year to the corporate office." I was shocked. My boss was actually a very smart guy and I really respected him for his business savvy, except when it came to advertising. I didn't want to argue the point with him, so I dropped the subject but it was still very difficult for me to believe that "making the sales numbers look higher" was his best reason for not advertising. I recommend that advertising people (usually the business owner or for large companies, it's the top people in the marketing communications department) contact us to make sure your free listing corresponds to your top advertising and marketing goals. Please contact me by phone or email and let's discuss advertising!